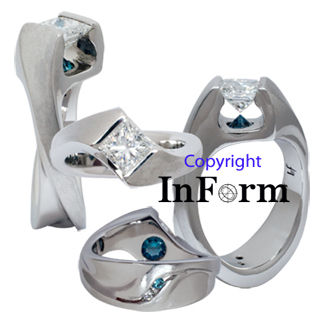 Seen below is a photograph showing four views of the same platinum engagement ring in which I've set princess cut diamond that shares much the same visual character as seen in a tension set ring. Having presented to the customer a group of diamonds from which to select, he chose the one I ultimately set in this ring that weighs 1.00 carat. Located immediately beneath the diamond, he asked that I set the blue diamond in an inverted orientation, which is essentially a sort of trademark characteristic often seen in ring I make. On the palm side of the ring, one each of a relatively colorless diamond and a blue diamond have been channel set in such an orientation that they visually refer back to the larger stones located in the upper portion of the ring.